Who Said The Sun Is Here To Stay? Who said the Sun will shine tomorrow? Here's the bad news: one day, the Sun will NOT shine anymore. Eventually, the Sun will die. It will be a beautiful thing to see. But there's a bit of a problem: long before, the dying Sun will simply have swallowed the earth. In case you didn't know, the Sun is in fact a huge nuclear power plant. It runs on hydrogen. The Sun transfers hydrogen atoms into helium by nuclear fusion. It's nothing like the puny hydrogen bombs humanity finds so impressive. Each second, no less than 400 million tons of hydrogen goes boom. Unfortunately, the amount of fuel inside the Sun is limited. You can't see it, but in fact, that huge light bulb in the sky we call `Sun' shrinks and cools down a tiny little bit every second. The Sun is `middle aged'. In another 5,000 million years, it will run out of hydrogen. Long before, we will notice the consequences. On the one hand, the Sun will get brighter and warmer. On the other hand, as the Sun shrinks and becomes less heavy, its gravitational pull on the Earth will loosen. Consequently, the orbit of our planet and all other planets in the solar system will widen. Okay, so an earthly year will be several weeks longer. But don't mistake, there's a downside here. It will get colder. And not just a little bit. Within `only' several billions of years, Earth will become an icy, permafrost planet, where it will be hard to survive. Well, we're still lucky, really. When the Sun eventually runs out of hydrogen, the nuclear reactions inside the Sun's core will stop. There will be no explosive force pushing outwards from the heart of the Sun anymore. The Sun will collapse, pressed together by its own gravity. Subsequently, temperatures inside the Sun will rise even more. And, lucky we, there will be another nuclear reaction sparking off. The Sun will start fusing helium into carbon and hydrogen this time. KABOOM! This will prevent the Sun from collapsing any further. Finally, we will have warmth again. But wait, we're in trouble. A nuclear power plant that runs on helium gives off a hell of a lot more energy and heat than one run on hydrogen. The new, immense power of the Sun's core will literally blow up the Sun. The Sun will grow, eating up several planets: first Mercury, then Venus. And next on the menu, yes, Earth. The absorbing 1961 movie The Day The Earth Caught Fire gives a pretty good picture of what it will be like. Sure, it will become quite hot. Rivers will evaporate, causing dense, hot fogs. The polar ice will melt, causing oceans to rise and entire countries to flood. But then, the sea will evaporate as well. Long before the solar surface reaches our planet, we will simply be barbecued to death. Sadly, there is no happy ending. Eventually, Earth will be swallowed by the growing Sun. Our planet will burn up in its ultra hot outer layers. Of course, we still have some 5,000 million years to come up with a solution for this nasty problem. For one thing, we might evacuate, or even find a way to move our entire planet away from the Sun. But even then, it's highly unlikely we will enjoy the Sun as much as we once did. Since the Sun has expanded so much, its outer parts will cool down. The Sun's surface will become cool, deep red. 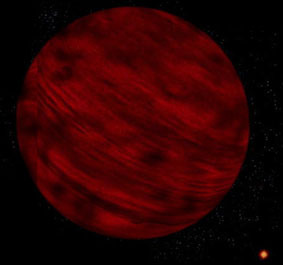 It will be a Red Giant -- `giant' being just the right name for an object that just ate up our planet. So there we are in our spaceship or wherever we are, glancing back at our red giant Sun. Will that be it? No, it won't. Even the helium-into-carbon reaction doesn't last forever. Eventually, after another 100 million years or so, the Sun runs out of helium as well. The nuclear reactions will stop again, and gravity will take over once more. The Sun's core will collapse further. But this time, a dramatic change will occur. The Sun simply won't have enough gravitational strength to hold itself together anymore. The Sun's outer layers will be pushed off into space. In other words: the Sun will explode. There will be a big nebula of super hot solar gas, flinging off in all directions. A beautiful sight, but not for us poor things. For many millions of years in a row, it will be like we're on the grill of a barbecue once more -- spaceship or no spaceship. And there will be radiation. Lots of it. Okay, so we decide to keep it cool and move our spaceship further away from the dying Sun. Still, even that won't be it. After the solar gasses and all the radiation have passed by, we will find that our vexed Sun has become a White Dwarf: a tiny, insignificant dot in the sky, still hot, but since there's no longer any nuclear reactions going on inside, cooling down fast. Should we move our spaceship back to the Sun to catch some warmth? Well, we'd better not. For one thing, the gravity of our deceased Sun will be way too big to cope with. 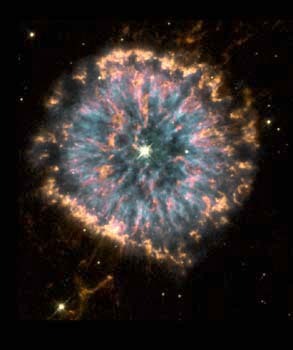 White dwarfs are incredibly dense. Although our ex-Sun will only have the size of the Earth, it will still have the mass of a star. A cubic centimeter may weigh several tons. So, by the time we'd reach a distance where it's warm and comfortable, our spaceship would simply crash into it. And, oh well, what's the point in visiting White Dwarfs anyway? In the end -- more millions of years later -- the Sun will be cooled down so much, it will no longer give off any warmth at all. It will be a dull, extinguished object called a Black Dwarf.